As far as features go, the Sony Alpha SLT-A55 is a mid-level digital SLR that shoots 16-megapixel stills and 1920 x 1080 full HD video. It’s got a full range of shooting modes handily accessed from a traditional mode dial on the left side of the camera. Shooting modes include full manual, shutter priority, aperture priority, program, scene modes, Auto and Auto+, which automatically selects the appropriate scene mode for you. The A55 also has a couple of specialized options on the mode dial: Sweep Shooting Panorama mode and Continuous Priority AE, which allows you to shoot action at 10 frames per second. I love the Sony’s Sweep Panorama mode. Basically, you just hold down the shutter release button and pan the camera and the camera magically makes a panoramic image for you – it’s a sweet feature. What sets the Sony A55 apart from other cameras is its SLT “transparent mirror” design. Digital SLRs have their best auto focus systems located on the mirror. When the mirror is flipped up for live view, they have to switch to slower, less accurate contrast detect auto focus. The SLT design means the mirror doesn’t have to flip up to expose the sensor when you take a picture; and that means the A55 and other Sony Alpha SLT cameras can use the superior phase detect auto focus system for live view and video as well as stills. No other camera maker can do that right now. Nikon has three digital SLRs with continuous auto focus (D3100, D5100 and D7000) for live view and video but the performance doesn’t come close to the A55. If you want to know more about the difference between standard live view auto focus and the Sony A55 system, read this technical description in my Nikon D7000 pro review. The A55′s transparent mirror design allowed Sony to replace the traditional optical viewfinder with an electronic viewfinder or “EVF, ” making the camera noticeably smaller than most entry-level digital SLRs. Compared to my Canon EOS Rebel XSi the A55 is a shorter, less wide and slightly lighter. It’s not a huge difference but when you’re traveling or backpacking every bit of space and weight counts. The feel of the camera is comparable to similarly priced, entry-level DSLRs. It has a nice rubber finish on the right grip that makes it feel secure in the hand. People with big hands who like chunky cameras may feel it’s too small but that wasn’t an issue for me – smaller and lighter are always good things in my book. No, it doesn’t have the solid feel of prosumer cameras like the Nikon D7000 or the Canon EOS 7D. But Sony has been teasing us with details on a new model, the A77, which is supposed to be a higher end SLT camera. So if you’re looking for a similar feature set and performance, hang tight for a few months and you should get your wish. One design feature I really like on the A55 is the tilt-swivel LCD. I didn’t think much of live view when it was first introduced but I use it all the time now for product photography and tripod-mounted landscape work. The A55 also has a built-in electronic level so your landscape photos won’t be tilted anymore. 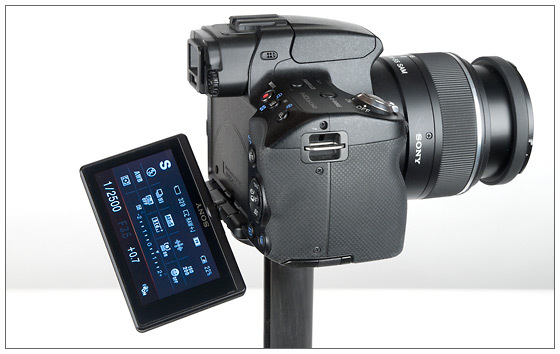 The tilt-swivel LCD display and live view also makes it possible to shoot from high and low angles. There is, however, one problem with the A55′s flip-out LCD display – the photo below isn’t actually possible with most tripod heads. I tried the A55 with both of mine (a Manfrotto quick release ball head and an ancient pan-tilt head) and in both cases the LCD display made contact with the tripod head when I tired to flip it down past the horizontal position. It’s still a great feature but I think the LCD displays that flip out from the side are more versatile. Last, but not least, like all other Sony digital SLRs, the A55 has Sony’s excellent SteadyShot built-in image stabilization. Instead of moving lens elements, the A55 compensates for camera shake by moving the sensor. The benefit? No matter what lens you’re using you have image stabilization helping keep your photos sharp. Mechanical image stabilization – whether in the lens or at the sensor – is an invaluable feature that makes a very real difference in image quality. Not having to buy special image stabilized lenses saves you money and ensures your images are always as sharp as they can possibly be. Great review John! I’ve been considering the A33/A55 as a backup to the A700, even a daily driver in many ways. Your review reconfirms a lot of what I hoped for with SLT, and the down sides are of no significance to my intended needs, (being a backup body). Now I just need to wait for their next A77 announcement before making any decision, my A700 is still doing me fine in the mean time, I can wait. Thanks for this review John – This re-enforces my decision to buy this a few months ago. I’ve taken approx 3000 frames with it so far and I think its great! The 10fps burst mode has already been used to ensure casual portraits come out the way I want them to and although I was a little cautious of the EVF, it comes into its own when you are stopped down on a manual lens and still wanna see clearly what you’re focusing on. The 18-55 that came with turns in a reasonable perofrmance, but I was taken by the quality of Sony SAL 18-250mm as a main lens. I think this is a superb “walkaround” lens – keep it stopped down at 5.6, or f11 at the long end and I find the sharpness is good. ( focusing at f11 is naturally slower, but for me normally okay for the subject at hand. thats a good review there… from the way it turns out, it appears sony has some market in the enthusiast for now, as most enthusiast is always lured by technology and features. Sony still lacks many things the other manufacturer has, if anyone says its not lacking, then they are just putting a blind on their eyes. Im not saying its a bad camera, its just not there yet, it is getting there though… knowing sony is an even bigger giant than canon / nikon and the growth of digital things, id say it will be soon enough that sony will start catching up and sit in the same game as with the 2 giants. Great comment, bram. There’s room for disagreement here and I’m glad you shared your experience. I don’t disagree with you on the camera controls, either. They are different and I did have a little trouble with them. I do think that if I used them longer I would have gotten used to them, though. Also, you’re correct about the A55 being designed for amateur photographers. It has better performance than its competitors, which could be sort of confusing. But the new Alpha A-77 and NEX-7 look very promising for photographers who want a more professional camera with better controls. I am a little disapointed with the user-unfriendly controls on this camera. I also have a Canon G11 which I took on vaction last year.I’m glad I didn’t take the Alpha 55 as the controls are too clumsy for me and I wish I had never bought it. also all my pictures are underexposedto a slight degree.